Mike Ragogna: How are you doing today, Macy? Macy Gray: I'm doing great, how are you doing? MR: I'm doing very well, thanks. Let's talk about your new album that's got a familiar title -- Talking Book. MR: What gave you the idea to revisit Stevie Wonder's album? MG: Of course, he's one of my favorites, and that's got to be one of my favorite Stevie Wonder albums ever. My producer Hal Willner, we were in Poland, of all places, doing a festival and we were talking about Nina Simone songs that he thought I should do and then he goes, "You know what no one's ever done before? No one's ever remade an album. You should remake an album." He wanted me to do this Nina Simone album, but redoing hers was one of those things that should be left alone. It got me on the track of remaking an album and Talking Book was the first one that I thought of because I just know it inside and out and I know what year it was made, I know what studio he was at, I know how many tracks are on it. I just knew I could interpret that. MR: Although most people might misinterpret the concept of doing a project like this as some sort of tribute, but this is not a tribute. MG: No, it's not a tribute. It's really me doing something I've never done before. It's my own way of showing Stevie how much I love him and honoring him the best way I can. 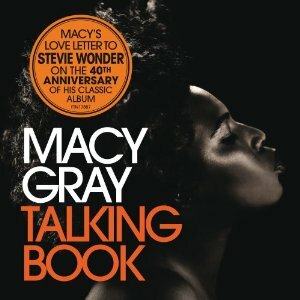 At the time, I didn't know that this was the fortieth anniversary of Talking Book, but I think that's a great way to celebrate it, and Stevie Wonder actually made his first album fifty years ago, so this is his fiftieth anniversary, which I don't know why that's not a big deal at the moment. I just thought there should be all kinds of tribute shows and stuff. MR: Isn't that amazing? Fifty years. What a phenomenal talent. MG: Yeah, he's pretty incredible. MR: Yeah, and also "Blame It On The Sun"
MG: "Blame It On The Sun," "I Believe," "Big Brother." "Big Brother" is actually my favorite song on his album. I love that song. MR: You know one of my favorites has always been "I Believe (When I Fall In Love It Will Be Forever)" and I am so surprised that very few artists have covered that song to this point. MG: Oh yeah, that's a perfect song. That's song's the best song ever. MR: Hey, are you going to move on to Innervisions next? MG: [laughs] No, I think I'm going to pull out on that. I'm actually in the middle of two original albums I'm making at the same time. MR: Might it end up being a double album? MG: No, it's not a double album. One is an EP and then the next one is a record I'm doing under my alter ego. MR: Who's your alter ego? MG: I haven't named her yet. MR: [laughs] If the name comes up during the show, share it with us, definitely. MG: I can't think of the name that I want. I thought I had the name but now I don't like it. MR: Maybe it's somehow associated with one of the Stevie Wonder recordings. MG: I'm sure that's it, yeah. MR: So let's give it a swing! MG: [laughs] No, it's coming to me, I've just got to be patient. MR: All right, what else have you been up to other than making two new albums and releasing Talking Book? What's going on? MG: Oh everything's pretty interesting right now. My movie just came out, The Paperboy, Daniel's movie. I've got an audition today for a cartoon, and then I have a lunch meeting and then I'm going to pick up my kids from school and probably come home and hide from them and that's pretty much my day. MR: [laughs] So how was work on the movie? Can you give us a little behind-the-scenes story here? MG: Oh yeah, it was one of the most insane stages of my life. I'm sitting on the set and sitting next to me is Nicole Kidman, of all people, and Matthew McConaughey's there and Zac Effron and John Cusack, who's really very incredible in this movie, and David Oyelowo from Planet of the Apes. It's directed by Lee Daniels, and it's this really bizarre murder mystery that takes place in the sixties in the South. It's based on the book The Paperboy. It's a really insane movie. It's wild. You'll see it and you'll either love it or hate it but you won't be able to stop watching it. You won't be able to leave. MR: And with that cast, nice. This was an actors' playground, wasn't it? MG: Yeah, it was really wild. I never had run into Nicole Kidman, you know what I mean? So it was pretty amazing to just be in that atmosphere, and Lee, of course, is my favorite director right now, so it was pretty great, and I got to meet some really awesome people on the set so it was good. MR: And speaking of the set, did it get crazy because of that kind of cast hanging out together? MG: Um, yeah, because everybody was in character and everybody's character is like psychotic, you know? Like John plays this mass-murderer who's in jail, and Nicole's like this ratty kind of slutty/trashy person and Matthew has this... Everybody in the movie is twisted, except for me. I'm pretty cool in the movie. MR: Of course! Okay, back to Talking Book, which is a forty year-old album. That's just not fair. MG: I know, that's wild. MR: Isn't that something? So what is your advice for new artists? MG: For new artists? Like as far as what? MR: Like as far as people who want to be on American Idol and maybe other talented folks who are out there doing it right now. MG: Okay, I would suggest, not advice because I don't like to give people advice because I could be wrong, but I think the best way to do it is to lock yourself up at first and really master your craft until you get good at what you do to the point where you're sure of yourself and you're confident about what you do. If you're a singer, you should be taking really good care of your voice, you should be hanging out with a coach once or twice a week, you should sing every single day as much as you can and then when you've got it down and you listen back to yourself and you love it, then you go out. And once you go out you go out as much as you can. If someone says, "Come here and play on top of my toothpick, two people are going to show up," you've got to do it because you never know who the two people are. That's what I did anyway. I played every night and then a guy from Atlantic Records just happened to be there and that's how I got my first record deal. All those guys, all those industry guys, go out every night looking for people, because that's their job. So I would just say get out there as much as you can and of course, this generation has the blessing of the internet, of Twitter and Youtube, so I would get very good at that. There's a lot of indie artists that show up number one on iTunes now because they're so diligent about their internet presence. It's possible, there's all kinds of avenues in you. There's all kinds of different ways to get there. I would just use all of them until you get what you want. MR: Wow. Nicely said. So what is the future looking like, other than hiding from the kids? MG: It looks like I'm going to be pretty busy. I'm writing a lot and talking to some people about a TV show. Now that my kids are getting older and they're much more prone to trouble, I feel like I've got to stay home more, so I'm just like working on stuff that I can do in LA or at least in one place, because this year, I bet we toured at least seven months out of this year. I'm going to try to hang out at home this year and do some stuff here. I haven't done that since my career started. MR: Have you taken the kids on the road with you? MG: Oh yeah, when they were little, I dragged them everywhere. They've been all over the world, but the thing about taking a one or two or three-year-old all over the world is that they don't remember it. They've been everywhere but they don't remember none of it. Now when I take them, they have a ball, but they can't go as much because they have school. MR: Wow. Speaking of Stevie Wonder, I'm going to share a not remembering story. I was talking with my dad the other day and he remembered that Stevie Wonder came by City Hall in New York City where I grew up. He was participating in some rally my father took me to. Anyway, Stevie was the musical act, and my dad put me on his shoulders to watch, and later on, we ended up standing right next to Stevie. My dad said he put me down and all I could do was stare up at Stevie in awe. MG: But you don't remember? MR: No. Now that's a memory I would love to have. MR: Yeah. Hey Macy, you need to come back here, this was really sweet, all the best. MG: Thank you so much. Take care.